When did you decide you wanted to join the world of acting? Was it something you sort of fell into, or has it been a passion brewing within you for quite some time? My passion for acting came first at an early age. I grew up in a very colorful Italian community where my uncles owned a produce market. The cast of characters were a revolving door of entrances & exits akin to a “commedia dell ‘arte”. I loved listening and watching their every move, and having a captive audience. That’s when I began impersonating them. Having a captive audience, the customers laughed seeing me imitate the priest whose sing song sermons had a message and moral to each story then the punch line, the girl scout leader who had a huge beehive, reciting the girl scout rules with a cigarette in her mouth and a lisp that came from her lips between each puff, the “bookie”, “who was all of 5’4” arriving with “the numbers” in his hand. His swagger ruled the roost. It was then that I was bitten and I never turned back! Learning the craft became my focus. First in junior college, then continuing to Boston Conservatory of Music, graduating with a B.F.A . Drama Major/ Musical Theater Minor. Then the world of acting opened wide. You were without a doubt the highlight character for me in the 1995 film Showgirls, appearing as Henrietta “Mama” Bazoom, which also featured past TWS guests like Robert Davi and Rena Riffel. You were absolutely hilarious! So what was it like to work on a project like this? Was it an enjoyable shoot? Somewhere in one of the Planet Hollywoods is a dress of Henrietta’s displayed in infamy! TWS guest Robert Davi and Rena Riffel were all part of the Cheetah Club clan. Robert gave the grit. Rena was the temptress of titillation. Rena & I had a blast when we were asked to put our handprints at the Vista Theater in LA as an homage to Showgirls! Elizabeth Berkley was “lightning in a bottle”. I love that woman. She was brave beyond imagination. Nomi was the only one who could get Henrietta’s Ta-Ta”s to HA HA ! Showgirls has proven to be timeless.. over 20 yrs later it is regarded as a cult classic and I LOVE THAT !!! More recently, you appeared on the hit of a show known as Orange Is The New Black. What was it like to be a part of a program like this from the beginning only to watch it blossom into the massive hit that it is ? The Orange Is The New Black tagline is “every sentence has a story”. I never would have imagined the epic story I could tell after being in 44 episodes and I am so honored to have received two SAG Awards. Jenji Kohan, the show runner, is our “fearless leader” and she is without a doubt a genius. Jenji cast the pilot with the majority of actors who sat together at Kaufman Studios Day 1 on set, not knowing the “arc” of their character or how many episodes they would be in. The playing field was level. Series regulars like Kate Mulgrew had star power. Even then I remember sitting next to her in the hair department. Wig’s coming in and out. “Red” had not been imagined…yet. Everything was raw and awesome in every aspect. I had never worked on a TV series, so the learning curve for me was an everyday event. In Piper Kerman’s book, Anita DeMarco was based on a real person Piper knew in prison. When I read for the role, I felt I immediately knew Anita . I became her the moment I put on my khakis and was set behind bars. I knew where Anita lived in her mind. The writing on the show is FLAWLESS! Piper Kerman gave me the greatest compliment when I first met her, she said, “Lin”, you are Anita! When the show’s critical acclaim increased after Season 1, I knew we’d be “riding a rainbow”. The show was a hit. Now indeed it is a massive hit and I’m still in shock that I’ve been a part of it. 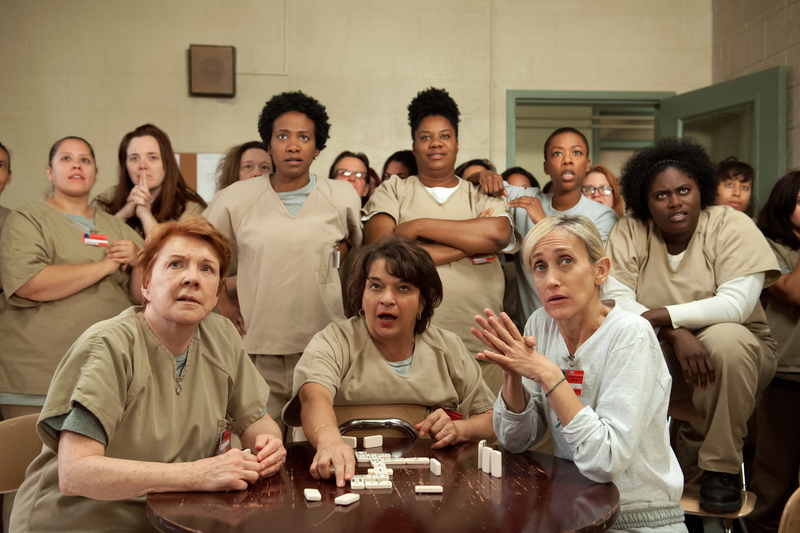 OITNB will go down in history as a Netflix phenomenon whose voice will resonate forever. I have to admit that I am very naïve and sadly unaware about something called, Nunsense? I notice that in your credits that you have appeared in a couple of these productions? I am definitely very curious, and would love it if you wouldn’t mind telling us a bit about this production? My first national tour in the USA was Nunsense. 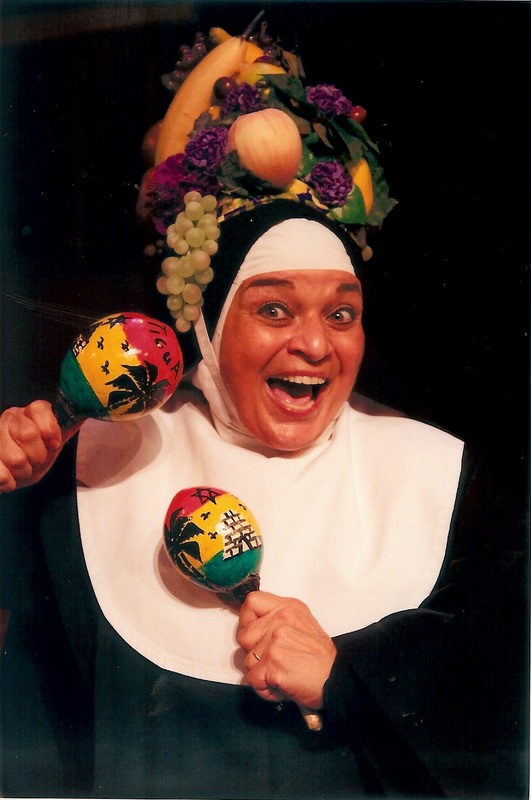 My character was Sister Robert Anne, a streetwise nun from Canarsie, Brooklyn. Nunsense is a 5-character musical. Robert Anne’s character was exactly like a nun I had in school, Sister Dora. My resume reflects many productions of the show because I absolutely LOVED LOVED LOVED singing & dancing as Robert. Little known fact: when I was cast in both Showgirls and OITNB, I had been doing Nunsense. I went from being a “saint to a sinner” then a saint to a “prisoner”! Robert is a wise cracking “bob & weave” kind of gal. Talks to her students in the language they can connect to. Each character in the show reveals in their back story what their dreams were if they did not have ‘the calling”. Robert sings a song “I Just Want To Be A STAR”…’nuff said! I was lucky to be in productions with the late great Phyllis Diller and Dody Goodman and Laugh-In’s wild & wonderful Jo Anne Worley. Nunsense legacy lives on… AMEN!! I am always intrigued and impressed by anyone in the acting world who has moved freely between film, television, and the stage, as you have done. And I always like to ask: If you were forced to only work in one of the mediums, what would it be? Why? TELEVISION !! I love everything about it ! The pace and craft is a master class of thinking on your feet. I love creating the character at home, delving into the intention the writer has written in each scene for the character, learning the lines, arriving on set ready to meet the director for the day’s shoot.. In TV, a plethora of “mega-mind’s” constantly surround you. Each bringing their own style and vision. Every episode has the footprint of the writer and director. I had the privilege of being directed by Jodie Foster on OITNB, yup ,TV….Acted & directed with Laura Prepon in the same episode on OITNB yup, TV ..Danced with RuPaul in the B’52 “Love Shack” video yup, TV ! Working with actors who move freely in all genres raises the bar when on a TV set. We share the pulse of timing in televison bringing the skills of a theater foundation. When I hear the word “ACTION” I get an adrenaline rush which is exhilarating. BRING IT !!! I have signed on for an indie film called Megaball$, a comedy feature . It’s about geeks, the Lotto & mob. The tagline is: You never know when you’re number is up ! My character is spicey! That’s all I can say! The Chiller Theatre Expo asked me to do an autograph meet & greet April 27 – 29. It is in Parsippany New Jersey. Come on down if your in the hood, would love to meet you. 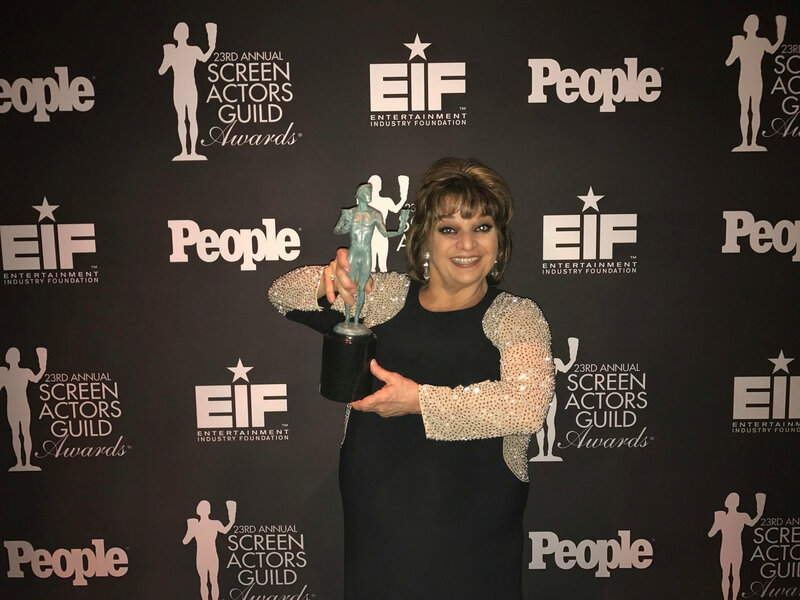 If the spirit moves you, join me on Twitter, @lintucci, and check out my FB page, Lin Tucci, for some fun behind the scenes OITNB photos and magical red carpet moments. Ron, I am smiling now ! Your questions reminded me of so many memories. Thank you for reaching out. Phyllis Diller once said ” a smile is a frown turned upside down”.